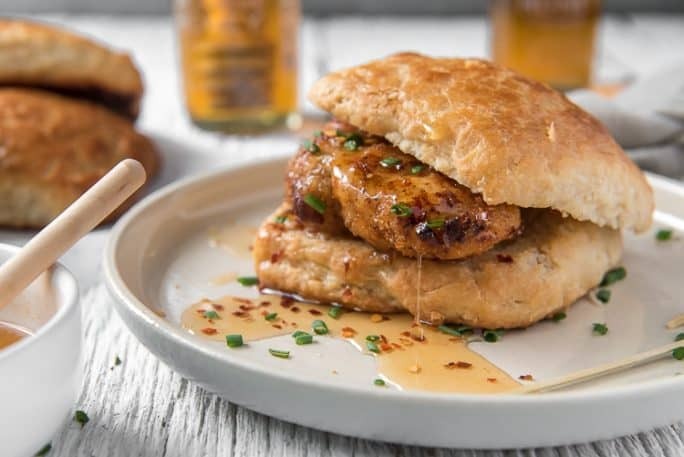 Skip the drive-thru and whip up your own irresistible fried Chicken Biscuits for dinner tonight! 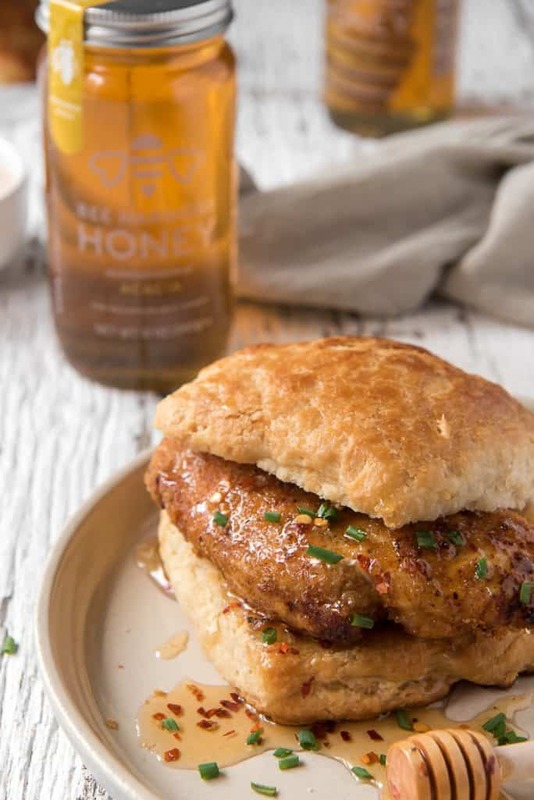 Easy homemade honey-buttermilk biscuits team up with air fryer chicken, spicy hot honey, and fresh chives for a flavor combo that’s sure to be a new favorite. I’ve got a Sunday lunch solution you’re all going to love. At least…you will if you’re like me and always and forever crave a chicken biscuit that you can’t get until Monday. But you might just forego the drive-thru version forever after dousing your homemade ones in hot honey. JUST TAKE ME TO THE BUTTERMILK FRIED CHICKEN BISCUITS ALREADY! 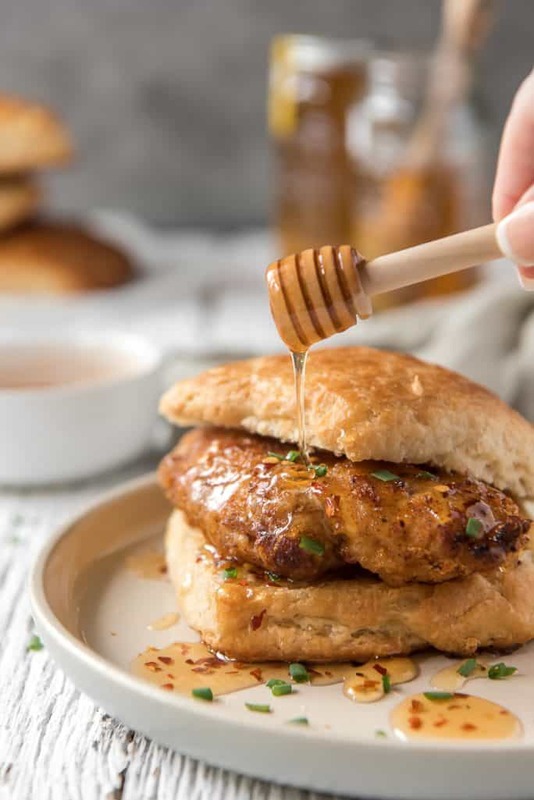 If you’d rather skip my (pretty darn helpful) tips and tricks, essential cooking info, and similar recipe ideas – and get straight to this deliciously easy chicken and biscuits recipe, just scroll right on down to the bottom of the page where you can find the printable recipe card! It has taken 30-ish years, but I’m finally in love with honey. I’m not sure what took so long, since there are plenty of iffy foods I came around to a lot quicker. Local honey, fruity honey, honeycomb – it wasn’t until I discovered Bee Harmony Honey that I looked forward to licking it from a spoon. This honey is seriously that good. And it really jazzes up these buttermilk biscuits, too. Now I’ve always been a little squeamish around the flying, buzzing little worker bees that make the honey. My lack of bee education is to blame. Although, I do know how important bees are to our ecosystem. Nearly one third of the food we eat relies on pollination from bees! Bee Harmony Honey is The Beesponsible Honey. The folks who run the company, and the trusted beekeepers they partner with, truly have a passion for keeping the bee population healthy, and it shows through their responsible, sustainable practices. The bees do their thing the way nature intended, and Bee Harmony Honey takes care of the rest – bringing us over two dozen raw honey varieties, including regional and organic offerings. So, in a conscious effort to cut down on some of the obvious evil calories this sweet-spicy-savory comfort food has, I put my fave little air fryer to work. Instead of deep frying the chicken like a typical chicken biscuit recipe calls for, a spritz of avo oil and some spiced bread crumbs made for a juicy & quite suitable substitute. Not gonna lie – I was seriously craving that buttermilk-doused chicken goodness on this sammie. If you’re looking for that, and aren’t worried about being bikini ready, by all means fry that bird up! Air fried chicken, though. It’s seriously good, and it loved the hot honey bath just as much as I did. Stop by Beesponsible.com to learn more about the company’s mission, their products, and how you can help give bees a voice! 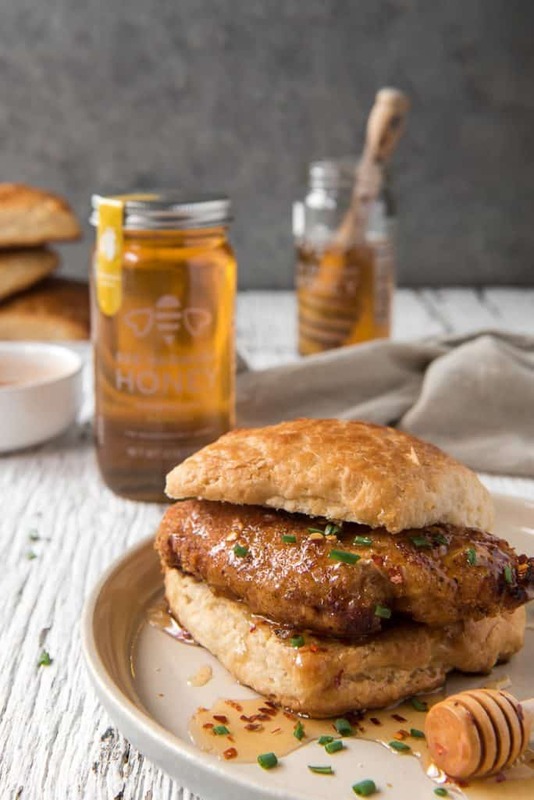 And don’t forget to order a jar or two of your favorite honey to take this chicken biscuit recipe to a new level! Homemade biscuits are so easy to make! They take a bit more effort than popping a can open, but the results are absolutely worth it! First, preheat your oven to 400 degrees F. Line a baking sheet with parchment paper or a silicone mat. Next, combine flour, salt, and baking powder in a large bowl. In a separate bowl, whisk together the buttermilk and 1/4 cup honey. Then, use a box grater to shred 12 tablespoons of frozen butter right into the flour mixture. Using a pastry cutter (or your hands), cut the butter gently into the flour until it forms small pea-sized balls. Try not to handle the dough much with your hands to keep the butter from warming up. Next, add the buttermilk-honey mixture and stir with a wooden spoon or spatula until a soft dough is formed. It gets a little tricky here, but stick with it! Turn the dough onto a floured work surface and form it into a 1/2-inch thick rectangle. Fold one side into the center, then fold the other side over like a letter. Gently flatten the smaller rectangle to the size it was before folding. Repeat the folding & flattening 2 more times. After the final fold, flatten the dough into a 1-inch thick 8×8 square. Use a bench scraper to cut it into 6 equally sized squares, then place them 3-inches apart on prepared baking sheet. Brush each biscuit with buttermilk, then bake them on the middle rack for 18-20 minutes until they’re puffy and mostly baked. 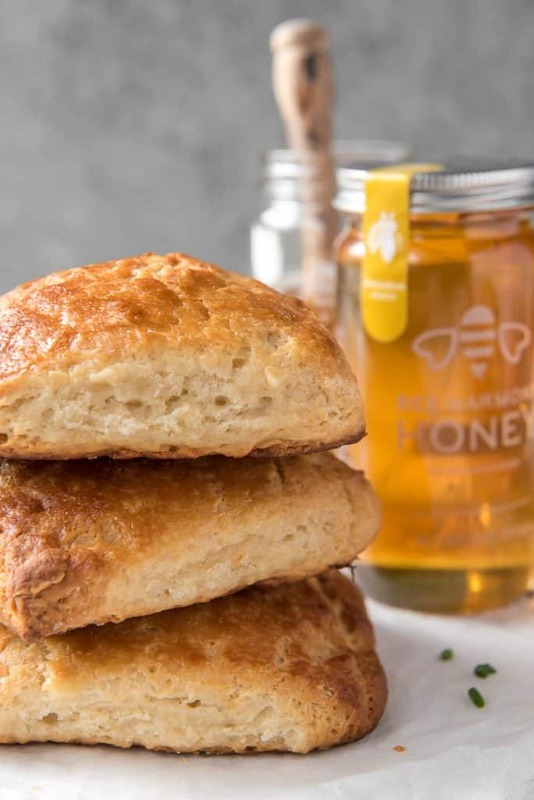 Melt the remaining butter and whisk in the honey, then brush over the hot biscuits before baking an additional 8-10 minutes until they’re golden brown. 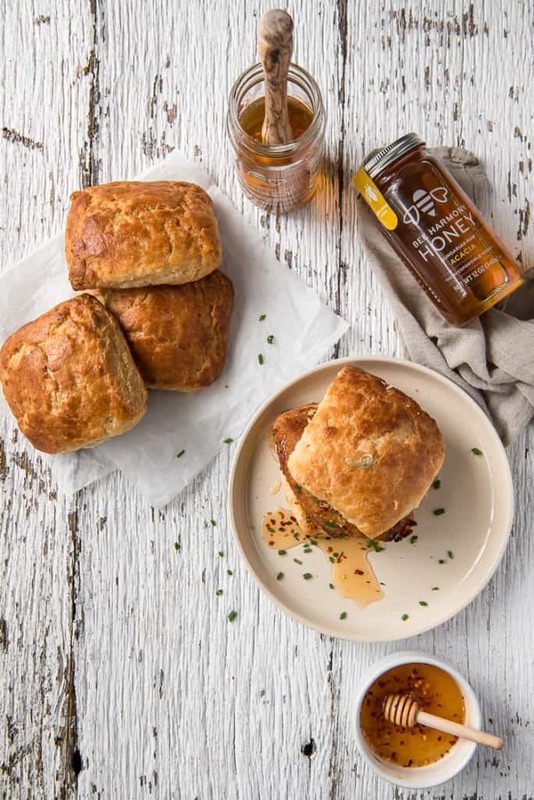 Skip the drive-thru and whip up your own irresistible fried Chicken Biscuits for dinner tonight! 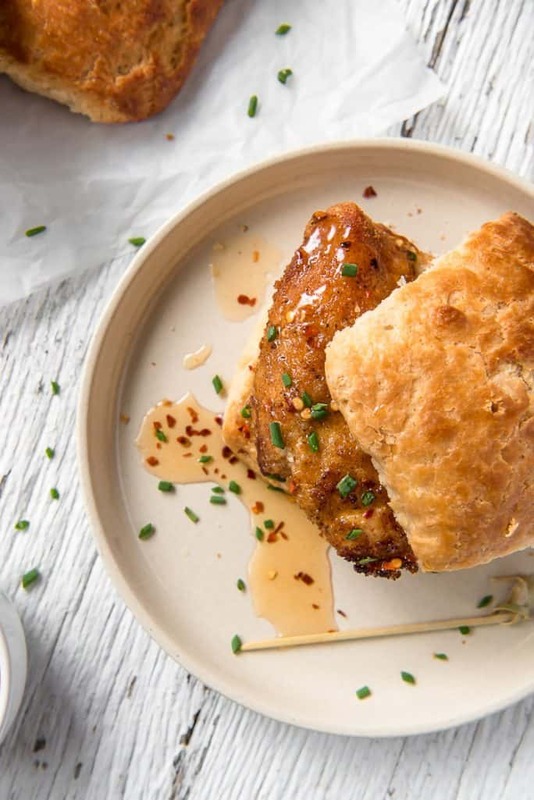 Easy homemade honey-buttermilk biscuits team up with air fryer chicken, spicy hot honey, and fresh chives for a flavor combo that's sure to be a new favorite. Whisk flour, salt, and baking powder in a large bowl. In a separate bowl, whisk together the buttermilk and 1/4 cup honey until combined; set aside. Using a box grater, grate 12 tablespoons butter into flour mixture. Cut the butter gently into the flour mixture with your hands or a pastry cutter, until it forms small pea-sized balls. Add buttermilk-honey mixture and gently fold until a soft dough is formed. Turn dough onto a floured work surface. Form it into a rectangle that is approximately 1/2 inch thick. Fold one side into the center, then the other side. Turn the dough so it’s long horizontally, then gently flatten and repeat the folding. Repeat the process a third time, then flatten dough into an 8x8 square, about 1 inch thick. Use a bench scraper to cut the dough into 6 equal squares, then place biscuits 3 inches apart prepared baking sheet. Brush each biscuit with buttermilk. Bake 18-20 minutes, until puffy and mostly baked. Melt remaining butter and honey in a small pan and brush over hot biscuits. Return to oven for 8-10 minutes until golden brown. Mix breadcrumbs, parmesan, paprika, salt, and pepper together in a small bowl. Spray chicken breasts with olive or avocado oil spray, then roll in breadcrumb mixture to coat. Lightly spray the air fryer basket with cooking spray, then place chicken in basket. Cook 15-16 minutes, flipping halfway, until golden brown and 165 degrees F internally. Combine the honey, hot sauce and pepper flakes in a small bowl and stir to combine. Split biscuits and place chicken on bottom half. Drizzle with honey, sprinkle with chives, and crown with top half of biscuit. 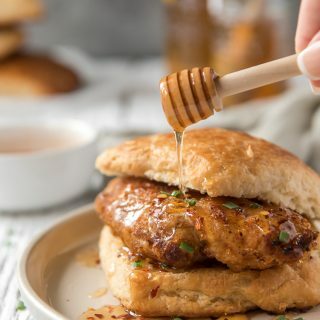 PIN THIS CHICKEN BISCUIT FOR LATER!